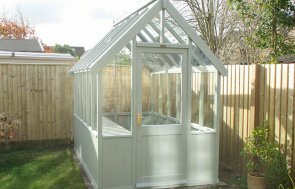 This customer has had two of our buildings installed their garden in Chinnor, Oxfordshire: a 1.8 x 2.4m Victoria Greenhouse and a 2.4 x 5.4m Superior Shed, and both are painted in our Valtti paint colour, in the colour Ash. The greenhouse will become a temperature controlled area enabling the growth of produce throughout the year. 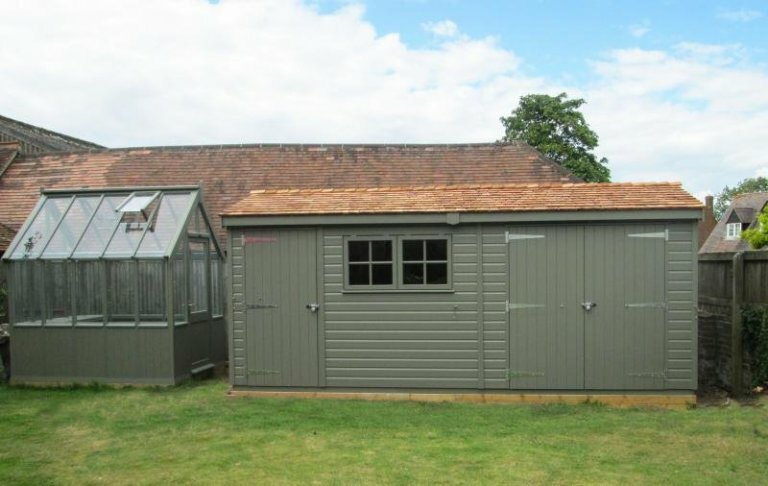 The Superior Shed has a partition in the middle, creating both a storage area, and a workshop with a workbench inside. 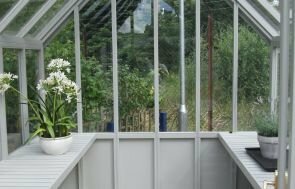 Automatic opening vents and two slatted benches, creating a corner space in the greenhouse, offer practical design features that will help the customer to get the most out of their building. If you would like to see an example of our Greenhouse you can visit our Burford Show Centre, which is not far from where these buildings have been installed. The storage area of the Superior Shed is 2.4 x 2.4m in size: it has double doors to gain entry, and no windows. The workshop is 2.4 x 3.0m in size with a single door and two opening, Georgian windows, as well as a workbench fitted underneath the windows on the inside. Cedar shingle tiles have been used on the roof of the Superior Shed for a rustic, country look, and other features the customer chose include an electrical pack with a heater, a heavy duty floor throughout, and a security pack. The security pack consists of a seven lever lock and heavy duty sliding bolts for the doors, as well as security screws for the door hinges (the customer didn’t want the stainless steel window bars). Both of these buildings suit the customer’s garden very well, with both of them providing solutions to the customer’s needs. If you like the idea of having matching timber buildings in your garden, whether they be Greenhouses or Garden Sheds, please call us on 01760 444229 or Contact Us and we will be able to help you go through your building requirements.